It is very rare to see a film that is truly, absolutely original. Beasts of the Southern Wild is exactly that, a rich, strange extravaganza that can honestly be promised to be like nothing you have ever seen before. 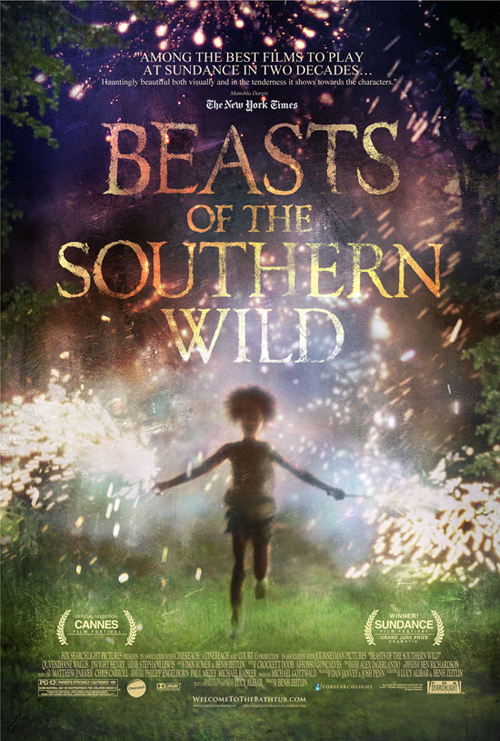 In The Bathtub, a southern Delta bayou community that is like an alternate-reality micro version of New Orleans, six year old Hushpuppy and her daddy Wink face many challenges, including natural disasters and the impending arrival of ancient beasts known as aurochs. First-time director Benh Zeitlin (who is white, although the film is almost entirely populated by black people) has drawn an absolutely astounding performance from six year old Quvenzhané Wallis as Hushpuppy, who is in every scene and will be nominated for an Oscar. Dwight Henry, as her father Wink, is every bit as brilliant – but he is an adult. The film itself is essentially unclassifiable. The closest genre it comes to is drama, but it has every right to be called a tone poem, a fantasy, or even a fantasia. The only logic that applies is the logic of dreams (and nightmares) but the father / daughter relationship and its attendant emotional challenges are all very real, and deeply moving. The cinematography is spectacular and some of the images are of the “once seen, never forgotten” level; the party that is celebrated on the film’s poster is one of the most beautiful sequences I’ve ever seen. The music, composed by Zeitlin with Dan Romer, is stunning (I will be seeking out the soundtrack album) and all the performances are beyond authentic; there are only fleeting characters outside of the two main ones but they all seem plucked from reality – if The Bathtub existed in reality. This movie has to be seen to be believed, and to be believed, it simply has to be seen. Dax Shepard, a huge car enthusiast, wrote and co-directed this amiable jaunt that is simultaneously a love letter to his car collection and his girlfriend, Kristen Bell. Shepard and Bell play Charlie and Annie, a young couple in love who attract the attention of various antagonistic types while Charlie drives Annie to another state for a new job. These types include a low-level criminal played by Bradley Cooper and a federal marshall played by Tom Arnold. Much rubber is burned along the way. 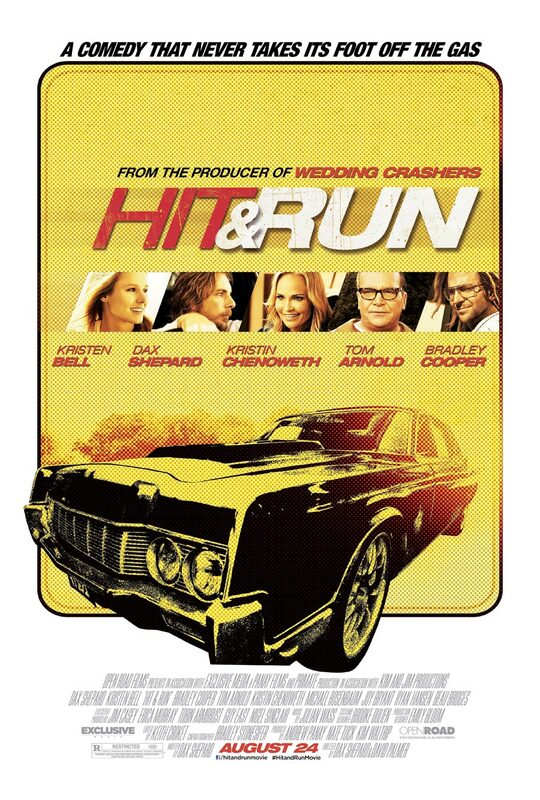 Inspired by the great car chase movies of the seventies and eighties, Hit and Run has a bouncy, goofy charm. Shepard used his own cars and his own girlfriend in the film and he obviously loves them all very intensely. Charlie and Annie’s relationship is subtle and extremely endearing; there is no doubt Bell and Shepard must really love each other in real life. Arnold is funny and Cooper is funnier; he’s got some terrific comic lines and is a very enjoyable presence. You won’t be seeing Hit and Run at the Oscars, but it’s got an independent, lively and loving spirit, and the enthusiastic energy of the enterprise rubs off on you as easily as the film then is to forget.